Catalog essay for the show that Mark Curated at the Penland Gallery, March 22–May 8, 2011. People often ask whether I was a student of Karen Karnes. It is always somehow awkward to answer. I first say no, explain that she doesn’t really teach, that I have gotten to know her over the years, that her work and place in the world are deeply important to me. That she is a mentor even though I never actually studied or worked with her. My hunch is that many potters feel this way. The thirteen artists whose work is represented in Many Paths: A Legacy of Karen Karnes certainly do. In fact, Karnes’s outstanding career of over sixty years has touched several generations of potters. She has inspired many young potters to pursue their unlikely vocation, and artists of her own generation—even those working in other fields—to take up clay. Her influence derives mostly from her quiet personal magnetism, integrity, and the uncanny power of her work. An encounter with Karnes is often a transformational event. Unlike many of the well-known figures of the studio pottery movement, Karnes never taught for any length of time at a university, influencing students as they passed through. Nor did she have apprentices working in her studio to internalize her attitudes and protocols and carry them forward, nor books extending her following. Many of the prominent mentors in modern ceramics have arisen out of such contexts. For example, the British potters Bernard Leach and his apprentice Michael Cardew not only influenced the many apprentices who worked in their studios, but their seminal writings reached thousands of readers. University professors such as Karnes’s contemporary, Warren MacKenzie (who himself apprenticed with Leach), have had important impacts on younger potters . Karnes has preferred to work in the quiet privacy of her studio, rarely employing assistants, and never directly on her work. Though she did share her studio at several points over her career—at Black Mountain College in 1952–4 with her then-husband sculptor, David Weinrib; and for several years with Weinrib and the poet, painter, and scholar M.C. Richards at the Gate Hill Cooperative in Stony Point, New York—she did so in the spirit of cooperative engagement with partners and peers. (She shared a studio again two decades later when she formed a life-partnership with Ann Stannard, an accomplished educator and artist, this time for a decade or so until Ann’s interests moved on to other areas.) But generally, Karnes fiercely protected the privacy of her studio and worked alone. Growing up, McKenzie Smith was an occasional visitor to Gate Hill, where Karnes had her studio for 25 years, and Smith’s aunt, Johanna Vanderbeek, was also a resident. He recalls Karnes’s formidable presence, amidst the wildness and freedom of the scene at Gate Hill in the late 1960s—“flat-out naked hippieville,” it seemed to him, in contrast to his more conventional Florida upbringing. Karnes stood apart, literally, as her studio was separated from two clustered hillside quadrangles, and in her serious and disciplined persona. She might indulge the band of roving boys McKenzie was tearing around with by giving them each a small lump of clay, but after a brief time she would indicate clearly that it was time for them to move on so that she could return to work. Her studio solitude only shifted as she entered her 80s and welcomed Normandy Alden, a student she’d met teaching with me at Haystack School in 2005, to share her studio in northern Vermont. By then Karnes was producing much less work and needed help maintaining her studio and rural homestead. Karnes is sometimes erroneously described as having been on the faculty at Black Mountain College, but actually she and Weinrib were artists-in-residence and did not officially teach. Curious faculty and students would visit the pot shop; M.C. Richards, for example, began working more seriously in clay there with the couple’s encouragement. Later, at Gate Hill, after she and Weinrib split up and MC moved back into the city, Karnes taught some classes in her studio, but she strictly limited her teaching to one afternoon a week and stopped when her pots sold more reliably. It was in these studio classes, though, that Mikhail Zakin, who had been working in jewelry and sculpture, took up pottery; eventually she helped Karen build her salt kiln. Zakin, five years Karnes’s senior, might be said to be the earliest and longest bearer of her influence. In the 1960s, as workshop teaching opportunities expanded with the growth of the craft movement, Karnes taught sporadically, twice at Haystack School and, notably, once here at Penland, where in 1967 she first salt-glazed, a career-changing event. From then on her primary material vocabulary turned to salt surfaces and her work for the next dozen years took on the iconic orange-peel texture and rich tonality that we associate with classic Karnes. But though many studio potters became regulars on the workshop circuit, Karnes did not. She was simply too absorbed with the private pleasures and demands of the studio, now irresistible as she was finding her voice—and market—with this new approach. Still, one workshop she gave at the Wesleyan Potters studio in Connecticut broke the pattern. It was so compelling that the students arranged to continue meeting every few months on an ongoing basis. The “Continuum,” as they called it, met periodically in different studios over half a dozen years until 1979, mainly under Karnes’s leadership, but also under guest presenters such as British potters Mick Casson and David Leach. It was as a peripheral participant in this group that Malcolm Davis first encountered Karnes. The institution, however, most associated with Karnes’s legacy is the annual pottery show at the Art School at Old Church Cultural Center, in Demarest, New Jersey, just north of Manhattan. The weekend show, which she has curated since 1974, each year features 25 potters from around the country. Potters donate a third of their sales to benefit the art school, which Zakin had founded in an old abandoned church. For years, the show was the main fundraising event for the school. When Zakin originally came to Karnes with the idea of the show, Karnes accepted her curatorial role on condition that the potters be “really treated well”: the school would provide them with housing, food, and prepared display spaces, take care of sales and packing so they could enjoy each other, mingle with the customers, and maybe even spend an afternoon in the city. This was to be a show by potters for potters. And the potters, Karnes was adamant, would be promptly paid. The atmosphere would be celebratory and coalesce around a festive potter’s dinner on Saturday night. The idealism with which the show was conceived is consistent with Karen’s early history of communitarian self-sufficiency, and reflects the values of mutual aid among the tradespersons living in the Bronx “Coops,” the first worker-owned housing project in New York City, where she grew up with her parents, who were garment workers and socialist union activists. Each year, Karnes introduces younger potters among the regulars who rotate in and out of the show. A few participants enjoy a kind of tenured status—Zakin, who has participated from the beginning; Rob Sieminski, since 1977; Scott Goldberg since 1980; and Malcolm Davis a few year later. All of the potters in Many Paths (with the exception of Alden, who is currently in graduate school, and Paulus Berensohn, who worked in other media and did not produce pots in quantity) have shown multiple times at Old Church. They all remember feeling honored and encouraged by Karen’s belief in their work, and especially grateful for the sustaining sense of community that she fostered. Bob Briscoe notes, “Karen proved that there is strong support for functional ceramics in the general public. By recognizing and nurturing this support, Karen has shown that it is possible for numerous potters to make their living doing what they love.” In fact, the show has become a model for several others around the country, notably the Northern Clay Center’s American Pottery Festival, which Bob Briscoe and Mathew Metz initiated after brainstorming on their long drive back to Minnesota after participating in Old Church in 1998 . This resonates with my sense of Karnes as an embodiment of the complete artist, one confidently in pursuit of a transformative vision, in harmony with the world, at peace with her refusal of its distractions, organically and inexorably moving with her work into new places. As she says in one of her rare pronouncements about her creative process, “The pots kind of grow from themselves—it’s a feeling. The forms will extend themselves—or contract. I feel my forms live in my body, on my breath.” It is this somatic integration of her creativity, her beautiful embodiment of it that makes her so compelling. These stories focus on Karnes’s influence on and mentorship of other artists, but it seems important to circle back to her early days as an artist, her own experience starting out. I have mentioned how Karnes’s conditions for curating the Old Church show reflected the ameliorative engagement of her childhood milieu, a commitment to helping others that is in her blood. This instinct was also nurtured by mentors and patrons who played different supportive roles in her early career. As a student in the 1940s, her creative gift was recognized by Serge Chermayeff, the Chechen-born modernist architect and designer who headed the art department at Brooklyn College. Chermayeff believed in her strongly and encouraged her to apply to Harvard in architecture. Though she declined, she is one of the only former students he singles out in his Chicago Architects History Project interview (1986) in which he calls her pot an example of the “brilliant… awfully good” students he taught at Brooklyn . He later arranged for her full fellowship at Alfred University in Charles Harder’s studio. She was again recognized during her stay in the Italian pottery town of Sesto Fiorentino when her work caught the eye of leading designer Gio Ponti. Ponti was so taken with her work that he featured it in his prestigious Domus magazine. Chermayeff and Ponti were both masters in fields somewhat peripheral to Karnes’s chosen one, and were in positions to offer avenues of advancement to the young Karnes. At Black Mountain College, Karnes experienced a different kind of a transformational teaching when she encountered a master working in her own material, the legendary Japanese potter, Shoji Hamada, who along with Bernard Leach, Soetsu Yanagi, and Marguerite Widenhain came to the college to give a seminar the first summer of her residence. She describes “breathing in” his spirit as he quietly worked, uncomplaining, with the available clay while Leach went on and on about proper clay, plasticity, etc. She says that whenever she had any doubts about throwing pots in front of a group she would recall Hamada’s peaceful undistracted presence. At the college she also enjoyed the support of the college’s rector, poet Charles Olsen. While in the 1950s, pottery was somewhat marginal to the heady abstract discourse of the students, Olsen wanted to move the college toward a curriculum based on his “institute model” where students would study consecutively four of bodies of knowledge that would begin with crafts, with pottery enjoying parity with weaving, architecture, and graphics. As he stated in a 1952 letter to Wildenhain (who he tried to recruit to the college before Karnes signed on), “…it damn well interests me as an act, (pots do)” . Finally, the architect Paul Williams extended generous patronage to Karnes (and the other residents at Gate Hill Cooperative), building her house and studio and even providing a VW bug for the community to use, enabling Karen to pursue her passion at a time when she had few material resources at her disposal. The consistent support Karnes has extended to others over her long career, then, is a reciprocation rooted in the legacies and support from which she herself benefited. The diversity and excellence of the work of the multigenerational assembly of artists in Many Paths and their connections to Karnes and to one another is testimony itself to Karnes’s rich legacy. Though the space here at the Penland Gallery has limited this group to a baker’s dozen, many more in the Penland community and around the country also carry her as a touchstone of excellence and a model of commitment, community, and integrity. Potters everywhere have been transformed by the fierce beauty of her life and work. Karnes is not just essential to the many paths taken by the artists in this show; her presence runs through generations of American ceramists. 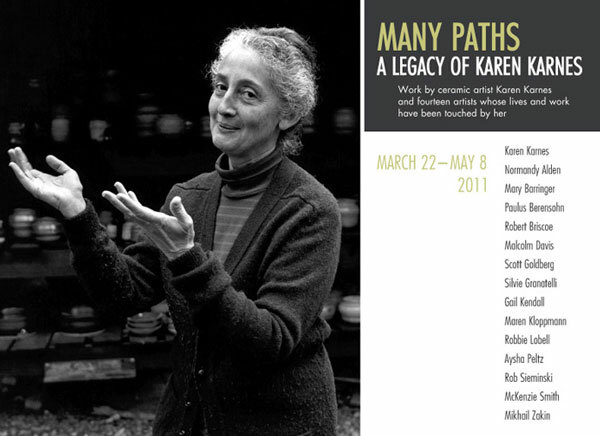 I am grateful to Karen Karnes for being the inspiring artist and person she is; to Kathryn Gremley at the Penland Gallery for encouragement and putting the exhibition together; to the Penland School for funding this essay; and to the thirteen artists in the show, for their work and their thoughts about Karnes’s influence that are at the heart of Many Paths. Finally I am indebted to my wife Pam Thompson for her incisive editing and unwavering support. 1 MacKenzie exemplifies this model of mentorship. From his position at the University of Minnesota, he created a vibrant ceramic culture and taught many students, notably an exceptional group of potters in the late 1960s, including Michael and Sandy Simon, Mark Pharis, Randy Johnston, Wayne Branum, and Jeff Oestreich. 2 The highly successful St. Croix Pottery Tour has since extended this legacy. The Tour, a circuit of six host studios north of the Twin Cities, hosts an additional three dozen guest potters and includes social events that reflect the community spirit that Karnes nurtured at Old Church. 3 Serge Chermayeff, interview by Betty J. Blum. Wellfleet, MA, 23–4 May 1985. Chicago Architects Oral History Project. (Chicago: Ernest R. Graham Study Center for Architectural Drawings. Department of Architecture, The Art Institute of Chicago) 26. 4 Charles Olsen, letter to Bernard Leach. 24 May 1952. Black Mountain College Papers, II. 25.